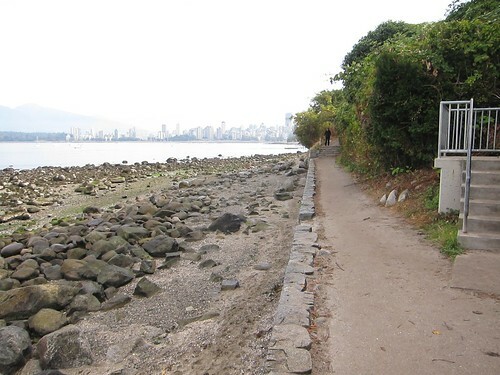 There was a proposal to build a path along a new seawall from Kits Beach to Jericho. 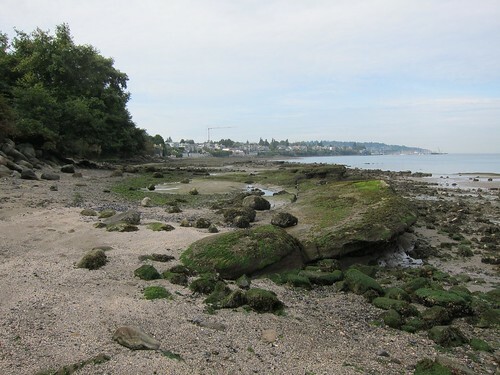 This part of the shore is underwater at high tide, but there are several access points and it is possible to walk between the two beaches at low tide. I did that today in about an hour. A shoe salesman told me that my walking shoes have “aggressive soles” – which I think means a deep tread. This certainly seemed to be useful as the beach is often covered in sea weed, wet sand and loose mussel shells. 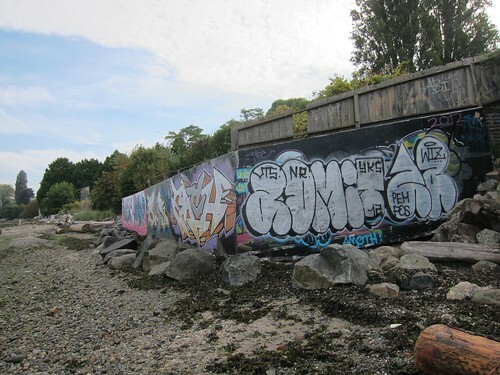 While I thought that the Parks Board had put off the idea, there are those who are concerned it might be revived and there is to be a meeting about that on Wednesday October 3, 2012 at 7:30pm at Kitsilano Sailing Club. It may be helpful to those who have not visited this part of Vancouver to see what it looks like. Hence the set on flickr. The set covers the foreshore from Trafalgar Street (the end of the current pathway) to yacht club at the eastern end of Jericho Beach, and then back along Point Grey Road to show all the access points along the way. No doubt if a seawall was constructed it would be wider and not have steps in it too allow for use by bikes, roller bladers and so on, as with the rest of the seawall. Actually, I am not sure that this is a virtue. At present, the area is not accessible unless you are willing to do a bit of clambering and rock hopping. I have seen people carrying their bikes along here, and wondered why they bothered. I have also been in a minor contretemps with a female cyclist on Point Grey Road outside Brock House. She was riding on the sidewalk – with a child on a bike trailer behind her, and simply rode “through” me – not stopping to apologize, if she was even aware of my existence, since she was talking over her shoulder to the child. Not that this is to characterize all cyclists, of course, but it is one of the things one remembers. 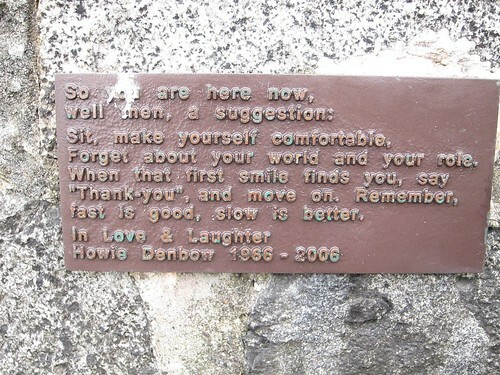 This plaque by the end of the path seems to sum it all up nicely. If there were a seawall along here to Jericho, it would become all about speed, as it would be treated in the same way as the seawall around Stanley Park which is a one way race track for those on wheels – and a bit of a hazard for the pedestrian flaneur. I told you at the top it took me about an hour – but that was not intended to be a challenge. After all I was stopping all the time to take the pictures. I was also on my own, but I think the walk would be much more fun with a small child or a marine biologist, and make the whole thing last even longer (keeping an eye on the tide, of course). The seafloor is actually interesting even without the flora and fauna. Shelves of sandstone jut out interspersed with areas of gravel. There is, mercifully, not a lot of mud along here. 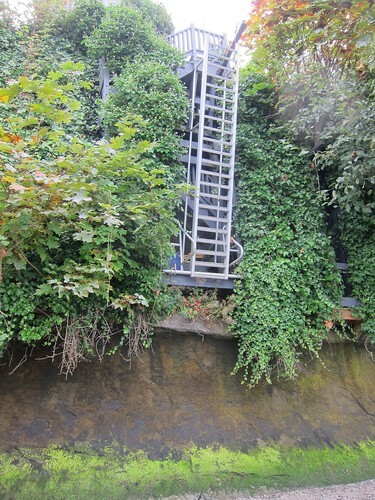 Some of the riparian owners have quite elaborate arrangements to give themselves access – and keep others off their own property. Others have neglected upkeep. But all along is plenty of evidence that while the foreshore is indeed a natural and wild area the edge of land is anything but. In many places significant amounts of effort have been expended either to secure additional space or to prevent erosion – which I suppose amounts to the same thing. Local street artists have done their best to reduce the dull greyness of the concrete used in these installations. 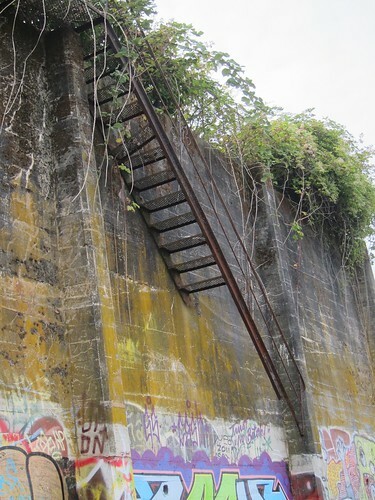 There are intermediate access points along the way if you want a shorter walk or if the tide takes you unawares. 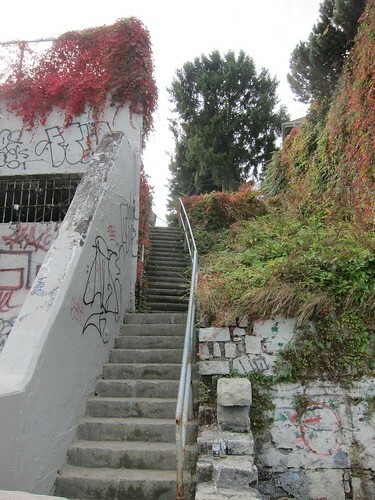 These steps are about halfway along at the foot of Balaclava Street. There do seem to be places where the property owners have very little concern about the visual impact of their “improvements”. I suppose because these have been in place for so long that they would have grandfathered “rights” if the City did decide to impose some kind of code of practice here. Also bear in mind that Point Grey Road has some of the highest priced property in the region. It also seems to me to reduce the value of the “wilderness experience in the heart of a big city”. When I first heard about the idea of “completing” the seawall, I must admit I was initially attracted to the idea. After all you can never have enough routes that are completely forbidden to motor vehicles and adjacent to the water. I also expected that the loudest protest would come from the property owners. 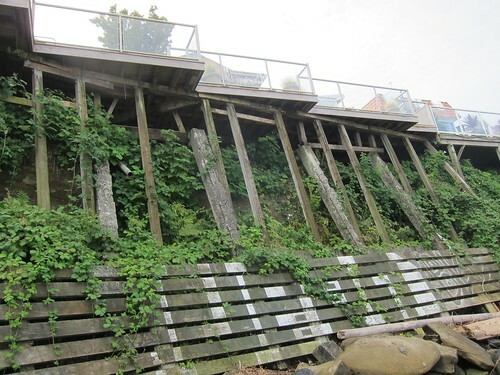 But it now seems to come from “the Point Grey Natural Foreshore Protective Society”. 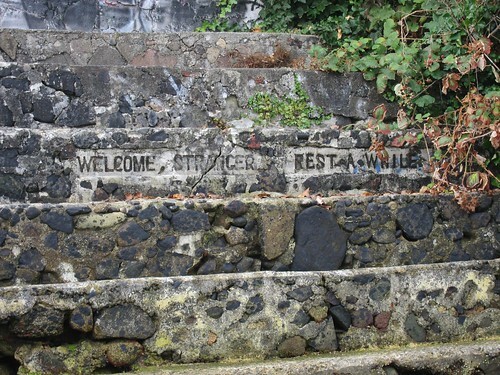 Actually one or two of the property owners actually seem to welcome people to the beach. 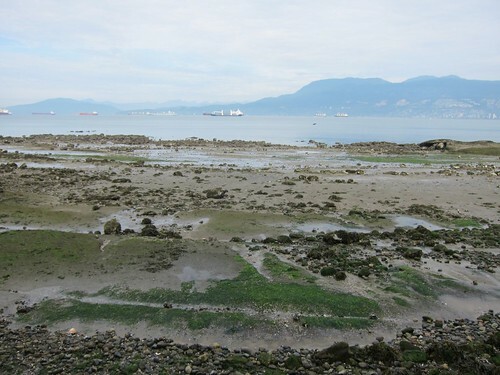 The first motion: that the Park Board, as the organization that manages the seawall with City Engineering, direct Park Board staff to work with city staff as appropriate to develop options for connecting the seawall from Jericho to Kits Beach and provide a timeline and cost estimates for these options, as well as address any environmental and First Nations concerns with the proposals, was deferred. Tired of being passed up? On an average day, there are hundreds of thousands of trips daily on Metro Vancouver’s public transit system. Whether you take the Expo Line from King George to Waterfront, the 99 B-Line from Commercial to UBC, the SeaBus from Lonsdale Quay to Downtown Vancouver, ride a bike down 41st Avenue, or drive your vehicle over the Port Mann Bridge every morning, you use Vancouver’s extensive transportation network. However, the current public transit system lacks three key things: the ability to handle current capacity, lack of service options to rural and suburban areas, and sustainable funding to provide for future growth. 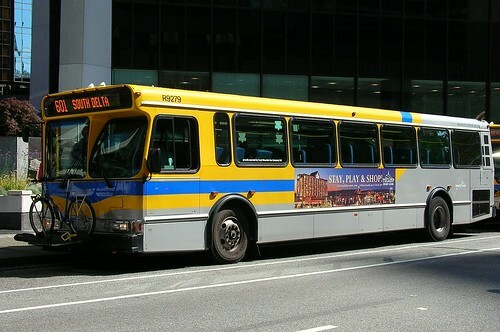 Get OnBoard BC believes in a better future for Metro Vancouver’s public transit system. We believe that the key to improving and expanding public transit is in developing a sustainable and fair funding formula. Our documentary takes a look at the current fiscal and political issues facing Metro Vancouver’s public transit system, and why Metro Vancouver needs sustainable regional transit funding in order to grow our region’s economy, promote ecological and social sustainability, and provide for a growing region. Get OnBoard Get OnBoard BC! That’s the trouble with talk radio. In between the adverts for cars and the best deal on tires, someone accuses you of saying something you didn’t say. It is not “either/or” (roads or transit) – at least becuase the road expansion is well under way and in the case of Port Mann/Highway #1 nearing completion. And I really do not expect a magic bullet or a tooth fairy to fund it – both things that got discussed before we got to the callers. In fact I think the callers got lined up before I started speaking. They evidently weren’t listening. But just supposing someone was listening to CKNW this morning and got intrigued this is what I am prescribing. We spent $3bn on a bridge and have to pay that loan down, so users are stuck with tolls for the bridge until it’s paid off. Meanwhile we have to find a way to fund transit expansion. It is not enough to come up with a formula that enables Translink to carry on as now – or allow some modest increase. We need a way to to ensure that transit can grow its market share. The current plan for 2040 is way too modest in my view. We need much more and quicker than that. I am also disenchanted with dedicated funding sources. The problem is that if you tie your funding source to something that is also going to change behaviour – and you are successful – then you are stymied. To some extent that has happened with the gas tax – and also happens with the carbon tax. I also dislike user fees – for the same reason. Pricing something is a good way to reduce consumption. It is also unfair to those who have little income – and therefore very little discretion on how to spend it. Of course those who are comfortable are quite happy to state that since they can afford the fee, everyone else should be willing to shoulder the same burden. Except, of course, they do not share the same ability to do so. The right wing has seized the agenda on taxes and made us convinced that income and corporate taxes have to be reduced in order to make us more competitive. That has simply got us engaged in a race to the bottom. We now work longer – households need multiple sources of income – in order to just stay where we were. Real incomes have declined. We may have the lowest income tax but that is only because we now pay through a variety of fees and charges for the same services – or rather in many cases, a reduced set of services. Plus a greater reliance on sales taxes. We continue to subsidize fossil fuels – both nationally and provincially. The latest expansions of natural gas exploitation are being achieved with a concession of NO payment of royalties to the province. The expansion of the oil sands in Alberta is only possible because of an extraordinarily favourable tax treatment. In both cases we would be much better off leaving it in the ground. For one thing the planet cannot tolerate the current rate of increase in carbon emissions. Since the IPCC’s warnings on climate change, CO2 output has not only increased, the rate of change has also increased. Fossil fuels left in the ground would also become much more valuable in future – because there are so many other things you can do with them other than simply burning them, all of which have much great value added and many of which are going to be very difficult to do in future. So I am advocating a two pronged approach. 2. Increase income tax for the rich and corporations – as well as a switch of enforcement away from chasing small amounts from the poor to the huge sums squirrelled away illegally in tax havens. You will note that these funds then have to come from the federal government as well as the provincial government. This is intentional. Canada is the only advanced western economy that does not have a national transit program. Senior Government support has to extend to operating funds as well as capital funds. We also should stop collecting tax from transit agencies – it is ludicrous that we levy a tax to pay for transit on fuel burned in transit buses. I am not going to suggest that we abandon private sector partnerships altogether. But if we are going to do them, we have to transfer the risk to the private sector. Translink revenues are being dragged down by the deal on the Golden Ears. It is unconscionable that money raised to pay for transit is being paid to a private company who built a road bridge we don’t need – and which cannot be paid for from tolls – which is what they promised initially. We also have to look long and hard at why Macquarie Bank is still getting paid long after the P3 for the Port Mann fell apart, and the project proceeded with public funding. There are two aspects to this – what we build and where we build it. Currently the priorities appear to be first the Evergreen Line and then – probably – a subway to UBC (though that is not set in stone, yet). Like the Port Mann, let us assume that the Evergeen Line is a done deal. It may not be the best one, but it is too late to change. If we commit to building a subway to UBC it will be because the current B-Line “cannot be expanded” and is overloaded, and the idea of light rail down Broadway, or more elevated concrete structure for SkyTrain, is intolerable on the West Side of Vancouver (but not anywhere else in the Lower Mainland, apparently). It will also mean that the part of the region that currently enjoys the best transit service will get more and, absent a new funding arrangement for transit, that means less everywhere else. The callers to CKNW this morning were appalled by the idea that they could be expected to use a bus. I cannot say I blame them, given what they know of bus service here. But if we are going to persuade people to get out of their cars and use transit, it is going to have to meet at least some of their needs some of the time. We also need to make the newer, better services widely available. Our current approach seems to – and does – favour some parts of the region over others. In part that is because the operator, being cash strapped, has to concentrate resources in areas where they get the most return. So if there is a ridership, there will be service – not the other way round. That is why things never change. Because we keep doing what we have always done. So in future we will have to see some innovation. And in some cases that means taking a risk with a new kind of service, in a place that doesn’t see it now. When the railways first got into the commuter business, at the end of the nineteenth century, there were no suburbs. They built out into green fields, and hoped that those would become new subdivisions. A bit like the way the transcontinental railway was built – in the expectation that they would encourage settlement in what were then seen as “empty” areas. Indeed, that was also the way that the interstate highways got taken over by people driving to and from work. Because subdivisions popped up like mushrooms after rain, right next to the off ramps. So if we have the ability to build rapid transit, it can only go to places that will see rapid and sustained increases in population. When the Expo Line was built through the East Side of Vancouver the residents of the areas around the stations were mostly successful in resisting an increase in density. We cannot afford that again. This seems to me to be a linkage that would allow for investment – and is a model in use in Hong Kong. There, the Mass Transit agency is a property developer. If that makes you queasy, turn it on its head, and come up with an experienced developer who knows how to do high density, mixed use development and create some kind of vehicle that ties the risks and rewards into producing transit and transit oriented development together. Stop thinking about transit – and transportation – as an end in itself. It never has been. It has always been inextricably linked with land use. Instead of building a new transit line and handing much of the increase in land value to a few lucky land owners and developers, indulge in some “joined up thinking” and get a better built environment and less car dependance on the same dime. But rapid transit is hideously expensive – almost as much as building massive highways and bridges – and relatively limited in its reach. And we need solutions for a very wide area, where mostly people drive themselves around in single occupant vehicles. So we start by tackling the paradigms of ownership and use – since most cars sit idle most of the time, and only one or two of their seats are ever occupied. That means breaking down the barriers we have erected – mostly to protect transit. The rules we now use came into being once car ownership began to spread after World War one, and “jitneys” threatened the viability of the (private companies’) transit systems. We are already seeing the impact of widespread, mobile information systems on car sharing. It would be even more rapid if it were not for these obsolete rules. Indeed, even those lucky enough to have operating licences apparently cannot make money because of the way the rules are applied. I do not advocate a free for all deregulation – but I do think that there is obvious potential when entrepreneurs keep popping up with ideas that seem to work but get slapped down – mainly to protect vested interests. It is also the case that even where transit service is good, people can come up with other services that appear to meet local needs better. So obviously there needs to be some kind of oversight, but the rules need to be drawn up to protect the broader public interest, and not just the narrow “economic interest” of the industry, as our current regulator has it. In some respects, with the creation of a new smartcard payment system, giving multimodal regionwide access, Translink actually will have a useful tool to ensure cooperation. So the same card that you swipe to ride the bus or SkyTrain could also get you a shared taxi, or a even an exclusive ride in a shared car, like car2go. It is instructive that modo – the car coop – expands in areas that are well served by transit. It is complementary – not competitive – to the transit system. You cannot expand the reach of transit deep onto low density single family home areas with a 40 foot diesel bus. And there are limits to what can be done with shared rides and demand responsive systems. The DART in HandyDART once meant “Dial a Ride” – but you now have to book days in advance and be qualified. The service that results satisfies no-one, but contains the germ of an idea that ought to be allowed to flourish, and benefit from the extra-ordinary explosion of information abilities of smart phones. It is significant, I think that the companies that need to hire bright young minds now provide bus service to get their employees to the workplace. The buses they use look nothing like a transit bus – they have wifi on board for a start – and do not pick up at bus stop signs. But a new app allows them to be mapped. I am willing to bet that the man who upbraided me this morning for expecting him to use something as slow and cumbersome as our current transit service would be quite happy to get on board one of these. The IT aspect means that all our current practices of mapping and scheduling can be discarded. The routes can be adapted on the fly, in real time, to meet changing need. The rigidity of regulation means that Greyhound can’t adapt service levels to changing needs the way Bolt Bus (its subsidiary) can. The same paradigm starts to make suburban shared ride services look feasible even of they don’t look a lot like transit does now – and maybe that is a good thing in and of itself. One of the reasons young people do not want a car – or a mortgage – is because we have loaded them down with student debt. Until they pay that off, a car loan or a 25 year mortgage is neither practical or appealing. Moreover, they no longer use the same systems we did to get in touch with each other. They have texts, twitter and Facebook. Almost anything can be set up on the fly – just ask the Occupy movement. I really doubt that it is possible to win over everyone to using transit and I am not even willing to try. There will always be some people driving everywhere all the time – just steadily less of them as a percentage of the total. After all, we could not cope with a sudden influx to transit – as the UPass so convincingly demonstrated. The way we built the Canada Line showed we had not really thought through what “change modal split” actually meant. There already enough people who want to use transit – and who want to use it more often – but are frustrated, to provide a significant increment in transit use. The increase in service just to meet those desires would also bring in more riders, as service frequencies and reach would make those services more attractive. This is the benevolent cycle of growth that has been seen in so many other cities that have stuck consistently to expanding transit. We, on the other hand, seem so besotted with short term point scoring that we are going to enter the other spiral – where cost cutting reduces service, and thus ridership and thus to further cuts. I am convinced that these systems will always respond to these dynamics. There is no steady state. It is either growth or decline. So the strategy I am suggesting is for conventional transit to incrementally add to its service – which means, right now, more buses. And more exclusive bus lanes – by taking road space away from single occupant vehicles. As demand grows, more limited stop and express routes – creating a hub and spoke system based on town centres, supported by an intricate and much more varied web of feeder services. That means space at the hubs has to be provided for bike storage, or shared bikes, as well as park and ride, kiss and ride, shared cars and station cars and shuttle buses. Rapid transit stations are, of course, hubs – as well as centres of mixed use, denser development – because they are within walking distance of so many services and facilities. I doubt that there will be many new rail based services added for a while – but obviously if there is an underused rail corridor available it must be pressed into use. Freight gets to use the lines when people are sleeping. Where there are highways, there will be rapid bus services – with priority where needed. At the very least so that those who insist on driving can have the educational experience of seeing the bus swish past them while they are stuck in traffic. Elsewhere it will have to be more and better buses – and the whole panoply of related “Better than the bus, cheaper than your own car” services. Since we have hobbled public enterprises, and are convinced of their ineffectiveness, the expansion has to incorporate private enterprise. But we should look long and hard at what we are doing before we do it. Compare and contrast BC Hydro before and after IPPs, for instance. Learn from the experience of Britain with its railway privatization – or the Underground in London – and benefit from their experience. There is no one simple solution – because although the problem looks straightforward (how to pay for transit) it is in reality complex and difficult because of all the connections. Politicians like big capital projects because they get to cut a ribbon. But what is needed is a whole range of small, incremental changes, and a shift in mind set. Mostly it needs a change in the way that government behaves. Thanks to Spacing Vancouver‘s mis-transcription of a headline I have come across some very important, Canadian, research. This shows that spending billions of dollars widening a freeway, including the widest bridge in the world, is going to be costing us huge amounts of public funds long into the future. and I have left that as a headline and made it a clickable link. A new study out of Toronto just published online in the journal Diabetes Care shows that if you live in a place where walking is difficult – like most new subdivisions – you have a much higher risk of developing diabetes. The study looked at just about everyone in Toronto aged 30-64 – the population experiencing the most rapid rise of diabetes incidence – and singled out those who did not have diabetes as of March 31, 2005. The study followed these people over the next five years: in all, 1,239,262 of them, including 214,882 who appeared to be recent immigrants based on registration in the province’s healthcare plan. By March of 2010, 58,544 of these people had developed diabetes. And the walkability of the communities in which they lived turned out to be closely linked to that outcome (given the complex factors that affect health, the researchers acknowledge that they can’t definitively say this relationship is directly causal). Maybe not definitively, but it is well known that the lack of physical activity is directly related to a range of conditions – heart disease, obesity and type 2 diabetes. Moreover, while you can live in a new suburb without sidewalks, drive everywhere and also exercise a lot (join a gym, run with your dog …) most people don’t. Although I do have to say that when you go to places like Buntzen Lake at the weekend and just see the numbers of people who do take exercise seriously, my hopes increase. The Toronto study highlights that within urbanized areas, the impact of neighborhoods on public health can vary significantly. And so there’s hope for applying this lesson in the parts of the world that have yet to urbanize, as well as within cities like Toronto as they continue to grow. It’s no coincidence that the least walkable neighborhoods identified in this research were often the most recently developed. Unlike their older counterparts, they had large blocks instead of smaller ones, sprawling development instead of density, separated land uses instead of mixed ones. Now we know that among the challenges facing the current government is the ever increasing rise in public health care costs. They are always looking to find ways of passing that along – BC being one of the very few Canadian provinces that levy a Medical Services Premium. “Slashing costs” through privatizing jobs like cleaning and looking after people who don’t need hospitals but do need long term care has also been a favourite. Perhaps less well publicized has been a recent shift in the way the government treats its own pensioners. The Public Service Pension Plan used to pay members MSP and Blue Cross premiums. So did the Teachers. Both of those are now borne by members. So much nicer than having a story about pension cuts, don’t you think? We know for a certainty that widening Highway #1 will both induce more traffic – and encourage the sort of development described in that last block quote – “large blocks instead of smaller ones, sprawling development instead of density, separated land uses instead of mixed ones.” The people who live in such places will in future be less healthy than those who can walk, cycle or ride transit on a daily basis. I include transit quite deliberately – since every transit ride has some walking at each end (transit takes you from where you are not to not quite where you need to be). Indeed, Weight Watchers has long advocated a simple way to burn more calories – get off the bus a couple of stops too soon. Walk to the next station not the closest one. 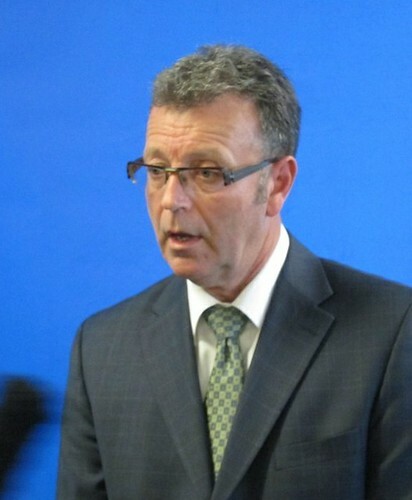 I really doubt that Christy Clark or Kevin Falcon actually care very much at all about anyone’s health but their own. But their policies do depend on them being able to rattle on about lower taxes. That’s why they love stories about spending cuts – and why they much prefer that Translink be audited multiple times, rather than deal with the real issue – lack of funding for transit expansion. But what the Toronto health study shows is that their preference for the sort of suburbs that we have been building and occupying since 1945, the sort of places that their paymasters have been selling us and which have been so profitable, are actually one of the causes that public health care costs continue to rise. We have got very good at treating conditions, but we are not very good at all in creating a healthier society. Prevention is always much more efficient than cure – or treatment for the incurable. The greatest health care problem is that caused by a sedentary populace. One that sits all day – in front of a computer screen or in a car to travel any distance at all. We do not have a health system: we have a sickness system. And there is a huge lobby of corporate interests that wishes that system to continue, unchanged. Doing the same thing repeatedly and expecting a different outcome is a good definition of madness – but it is also an accurate description of conservatism. The obsession with resisting change, with refusing to admit that what we did was wrong and that we need to do things differently. Transit is not a local problem. It is not something that municipalities can or should fund on their own. It is part of a much broader picture. The province cannot continue to pretend that it does not have an immediate and direct concern. Its highway policies – the construction of the wider Sea to Sky Highway, the South Fraser Perimeter Road, the Highway #1 expansion were all driven by property developers. All of them were directly contrary to the precepts of the Livable Region. The people of this region have repeatedly told the political leadership that they valued compact urban development, complete communities, with protection for the green zone and increased transportation choice. Oddly enough it was Gordon Campbell himself who came up with that formulation – when he was Mayor of Vancouver and Chair of the GVRD. And it was his government that chose – carefully and deliberately – to wreck that strategy, for short term political gain. 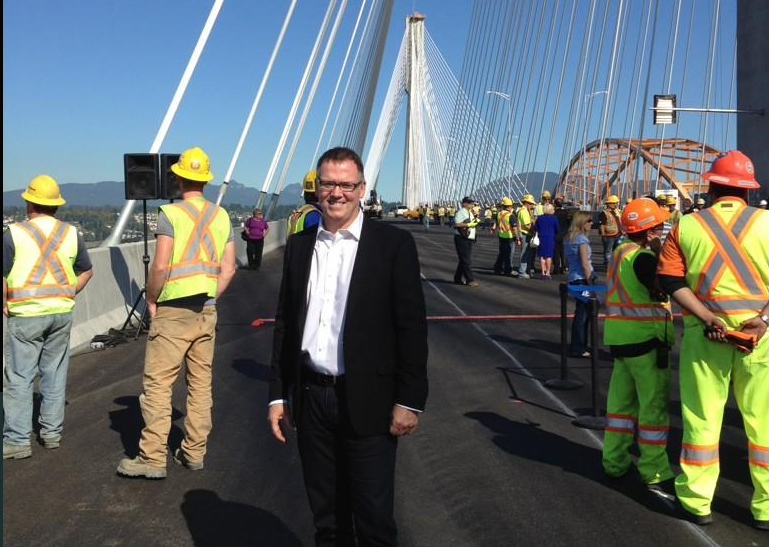 There is no doubt that the widening of the Port Mann Bridge was – and is – very popular. But not only will it not solve the congestion problem (building roads has never cured congestion anywhere) it is also going to create a series of problems long into the future. Increasing public health care cost ought to be one that catches their attention – since all of the others they seem happy to ignore. The tables were around the outside and the picture below is what I had to look at throughout the presentation. Nancy Olewiler the Chair of the Translink Board opened the proceedings by pointing out that there has been a significant growth in transit use in recent years. What I really noticed was the change in tone – for what the professional appointed Board is now saying is that they have done the best they can, but the current shortage of resources means that their best is simply not good enough. Translink can no longer grow, even though the region will continue to grow. The best they can do, once they have built the Evergreen Line is hold on to what they have, despite having very little in reserve to cover for unforeseen eventualities. What do we do now? The plan has to deal with the Translink Commissioner’s decision to only allow part of fare increase. They have found the efficiencies he called for and will reapply for the increase, but they have not included that in the current draft. Gas tax revenues are down. “We are the victim of our own success”. 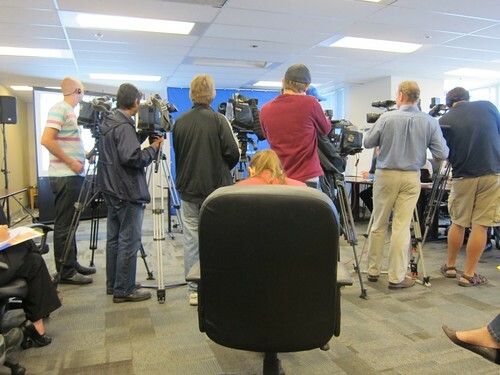 The Province has refused to announce any new source of revenue, and continues to refer to the need for efficiencies. Because of this lack of commitment, The Mayors do not wish to see an increase in property tax, even though it has already been approved and therefore is in the present plan. 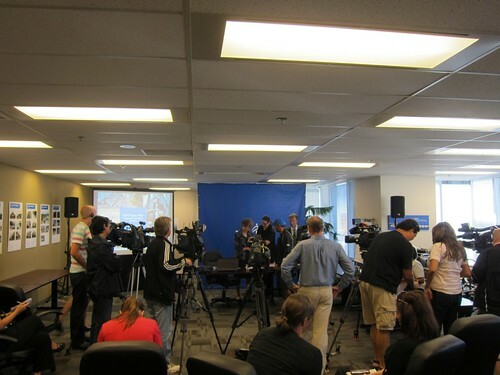 The 2012 “Moving Forward” Plan adopted by the Mayor’s Council in October 2011 assumed that there would be an agreement with the province on a new $30m per year funding source. That has NOT been identified. Oakridge (the former Vancouver Transit Centre) cannot be released to the market yet as it continues to provide essential functions, including maintenance of the trolley overhead, community shuttles and storage for spare vehicles (which will now be sold). This was to have provided $150m which will no longer be available to fund operations. Fuel revenues have been in decline: as gas prices rise people switch to transit but Translink’s fuel cost rises and income falls.”Perhaps we have reached the tipping point.” The graphic below shows the drop in the volume of fuel sold in the region last year and an increase in Fraser Valley. “People are crossing the border but we have no actual data.” Over the next three years Translink forecasts that fuel tax revenues will be $144m lower than what the 2012 “Moving Forward” Plan assumed. Highway #1 coach service will be in place when the new bridge opens. There will be a bus every ten minutes at peak peak periods, every 30 minutes offpeak, from Langley (the plan reads “Carvolth to Braid”) nonstop. A new B-Line will operate from Guildford on 104th to King George the south but it cannot get to South Surrey and White Rock as originally intended. It will now run as far as Newton. The upgrades to existing SkyTrain stations can leverage $160m in senior government funding. Will be consulting, plan on web site. We are consulting on two years of property tax increase – if the Mayor’s do not agree then we will have to cut further. When the Mayors said no to the property tax increase, they did not have the information on the loss of fuel revenue or the impact of the commissioner’s descision on fares. What will be the effect of the Port Mann toll cut on the Golden Ears? The two bridges serve different markets. The Port Mann bridge has been free up until now and the introduction of tolls on it can’t hurt us. Where will the buses for the Highway #1 service come from? Have you included increased fare revenue from gates? It’s a timing issue – there will be more when they are activated. There are no results yet from the Provincial Audit. It is expected to be announced next month. We nay have to make changes, but we have done a lot of work on efficiencies. That means firstly that we are nowhere near 14% now – which I regard as disgraceful. Yes we have seen significant increases in transit ridership, but we have not seen has been what was necessary. And these transit mode share targets were supposed to have been achieved in the Livable Region Plan years ago! The powerpoint slides show Transit Market Share at 10% in 1999, 14% in 2011. There was an 80% increase in transit trips between 2000 and 2011 – but a lot of that was due to rising population and increased travel. The expression “will plateau” implies to me that we still have some way to go to get to 14% now – we must have fallen back since the Olympics. The apparent failure of transit is quite clearly not the fault of Translink’s Board or management. The blame must be laid at the feet of the politicians – the BC Liberal government and the Mayors – who continue to battle over the same ground they were fighting over fifteen years ago. The creation of a Regional Transportation Authority was supposed to end the argument about whether gas tax revenue came from the Provincial revenues or the regional population’s pockets. The failure of the previous NDP administration to deliver on the Regional Vehicle Levy, which was part of the GVTA Act – was the start of the decline. Then the argument over the Canada Line – and the removal of powers from the Mayors – and the failure to deliver the Evergreen Line at the same time as the Canada Line – all can be laid at the feet of the present administration. They were also the authors of the disastrous plan to widen Highway #1 – which essentially puts paid to the idea of a sustainable region. The Province of BC needs to get its head around the reality of climate change. It cannot now be averted. It is upon us much faster than expected and will be much worse than we first thought. That is because we have been increasing our use of fossil fuels – and BC has been part of the dramatic expansion in production of oil, natural gas and coal. The fact that much of this gets burned in other places does nothing whatever to reduce our responsibility for the problems we face. We can’t do much about reducing our car use if the place we live in is designed for cars and not people. We can’t switch to transit if there is no more transit service than we have now. What we have here is not enough – never has been – and what is proposed is also woefully inadequate. It is also pointless to keep repeating that we “cannot afford” more – when the reason we have a rising deficit is due to cuts in taxation – especially cuts in income tax for individuals and corporations. Switching to taxes on consumption is regressive and thus unfair. Our heavy reliance on flat fees like Medical Services Premiums is a good example of what is wrong. BC is a wealthy place, and Vancouver one with some of the highest personal incomes in the world. Pretending that we “cannot afford” a decent transit system is ridiculous – especially when it appears that we can afford to widen a freeway, but only charge a toll on the bridge. It also must be said that rising gasoline prices have lead to declining consumption everywhere: it is not just the impact of rising gas taxes in this region. Reliance on gas tax is causing problems for transit systems across the US. By the time this plan is approved and implemented, the current government in Victoria will be packing its bags. I trust that the new government will treat this issue as a very high priority. BC only has one major metropolis. Its government and services cannot be like any other city in the province but its long term success is critical to the province. And the current mess of its transportation system cannot be tolerated for much longer. The whole region needs a lot more transit service, and we need to find a way to pay for that that spreads the load fairly and appropriately. Enbridge produced a video which carefully edited out the islands which make navigation so tricky between its proposed pipeline terminal and the Pacific Ocean. This video shows what is really at risk. Please sign the petition. The Port Mann Bridge project has been steeped in controversy from its humble beginnings as an economically prudent plan to twin the existing bridge at a cost of $1.5 billion to what we’ve ended up with today: a completely new bridge and highway project totaling $3.3 billion financed through tolls. First it was never, ever “economically prudent”. It was based on misdirection – that somehow the traffic jam of cars every day was threatening the competitiveness of the Port of Vancouver. The truckers were always front and centre of this argument. This fiction was fairly easy to dismiss. Most of the tonnage moving through the port is bulk commodities that come in by rail – and pipeline (of course but lets not get distracted). The container imports also move by rail – except for those destined for distribution facilities which tend to be located on cheap land at some distance from the port terminals. What the intention was – always – was to widen the freeway from the Vancouver boundary to the Abbotsford boundary. The Port Mann bridge was never a standalone project. It might have been defensible if it had simply been a removal of a bottleneck to free up short distance movements between Surrey and Coquitlam (which is what most of the traffic over the bridge does in reality). But all that is planned is to replace a small bottleneck with a bigger bottle. The number of lanes on the bridge was always less than those leading on to it – and that will still be the case afterwards. There will just be more of both. The Gateway made the idea of freeway expansion palatable because it was wrapped up in rhetoric about economic growth and increased competitiveness. The reality was different. Kevin Falcon was a developer before he became a politician. There has always been a strong lobby against the regional plan which was seen as restricting what developers could do south of the Fraser. 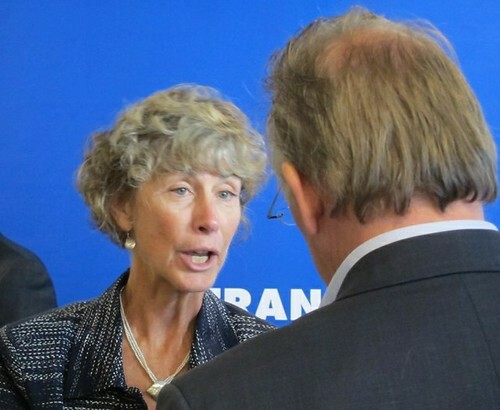 In fact, it made very little difference, as Doug McCallum ably demonstrated when Mayor of Surrey – and Chair of Translink. He easily duplicated the spread of big box retail along Highway 99 to replicate what was already in place in Whatcom County along I5. Junction “improvements” on both Highways 1 and 99 were funded by deals with developers on what had been land reserved for highway expansion adjacent to the intersections. And the sprawl of supposedly “affordable” housing (“drive till you qualify”) continued unabated. Kevin ran for election using funds raised at breakfasts attended by the real estate community who he encouraged to “get on board”. The highway expansion would enable them to build more of what they has always built and they knew they could sell. What made them really nervous was talk of transit and transit oriented development – for they were unfamiliar with both. Rail for the Valley was pretty much a hopeless case. Not that it could not have been done physically or financially – just that it was a hard sell to the money men. The people who fund the BC Liberals and pick their preferred candidates. To those of us who travel the bridge, it had been clear for years something needed to be done to address the gridlock on both ends. Public transportation south of the Fraser is horrific during the week and nearly non-existent in some areas on the weekend, making vehicles mandatory for most. At least she declares her interest. We know that the only effective way to address “gridlock” is to reduce peak demand for single occupant vehicle travel. In the short term the only way to do that is to price car use, and increase transit supply. In the longer term, denser and more mixed land use – served by walkable and bikeable routes – is the way to break the linkage between growth and sprawl. Again, really attractive transit has to be part of the mix. The provision of billions of dollars of provincial funding for highway expansion – and the new bridge – is one of the reasons why there is a crisis in funding for transit. It does look like there will be a rapid bus service of some sort when the new Port Mann opens but the only way that can be funded is by cutting service elsewhere. There are options – there always are – always were. Just most of them get rejected. The BC Liberals kept dancing around insisting that there had to be more local funding – mostly because they always wanted to tap into property tax some more. And the insistence on looking for more efficiencies was always a good distraction. As was fare evasion: actually only 4% of riders have no ticket and the revenue loss is less than that. But somehow much money and attention can be thrown at that “problem” – but nothing to deal with overcrowding other than diversion of existing resources. And the idea of increasing transit service were it is currently inadequate or non-existent just does not get onto the radar because the places that already have good transit want more. I can understand Laila’s anger – and her choice of target. It is just all too short term. I do not expect the BC Liberals to win – as the latest polls confirm. The problem is that afterwards it is going to be very hard to reverse the land use changes already in train as a result of the decision to widen the freeway. The type of development we are seeing – and will see – is not going to be sustainable, transit oriented or readily convertible. Land uses in Coquitlam and Vancouver will change a bit once the Evergreen and the UBC lines open – but not by nearly enough to shift the region’s mode split by very much. South of the Fraser is car country now – and still will be – and all of the emphasis is going to have to be how to make those cars less of a problem. So expect a lot more attention on car sharing, alt fuels and electric vehicles – none of which individually has much impact and even collectively is little more than a band aid. The systemic problem of car dependance will remain even if we can overcome some of our fondest held beliefs – like car ownership and not sharing rides (not getting into cars with strangers) and the need to limit access to the public transport market. The tolls – which after a year will go back up to $3 a crossing – will have some impact on restraining demand for car trips between Surrey and Coquitlam. They might even get better at pricing strategies than they have so far on the Golden Ears, which has plenty of underused capacity at peak periods. But it will have no impact at all on car use on the rest of the Highway. There will be no toll for a trip between Vancouver and Burnaby, New Westmister or Coquitlam. No-one will pay a toll between Surrey and Langley. And there will be a lot of lane space that will quickly fill up – even if some people will be making longer (but perceived to be “faster”) trips to use that new space. Yes, car use in the region has declined a bit – but mostly in places where there is an alternative. Along Highway 1 – until it fills up again – car use will grow. And that means a lot more traffic on the local road network that feeds the freeway. And more pressure from neighbourhoods to spend money on frustrating the through traffic, rather than spending money on better alternatives for local trips. Laila is, I think, right in that this obvious tactic will misfire. But that is not the real issue. How do we now persuade people that it is worth spending more money on a transit system that is so blatantly organized to favour part of the region at the expense of the rest?